If you have a child with food allergies, you know the fear that Halloween brings–not fear of the tricks, mind you, but fear of the treats. Any occasion that encourages my allergic child to accumulate a mountain of candy from a variety of sources is enough to strike fear into this Mama’s heart. As a general rule, I tend to reside in the “our children are overly-sugared” camp. Still, I would never dream of depriving a child the ritualistic pleasure of loading up on the goods on Halloween. And that includes my child with food allergies. I want him to enjoy the gathering, sorting, swapping, and (rationed) consumption of his treasure just as much as his sister does. But since those shiny wrappers also contain a potentially life-threatening reaction, there needs to be an extra “layer” of precaution. No one wants to end Halloween with an Epi injection and a trip to the ER (or worse!). 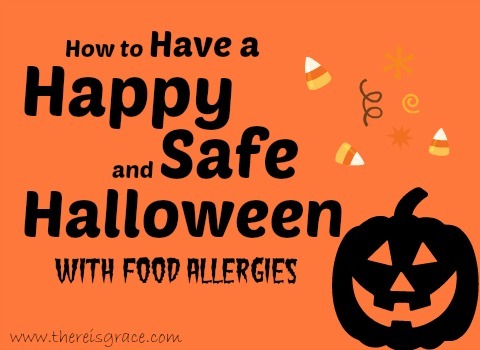 So, how do you have a happy and safe Halloween with food allergies? We don’t do much door-to-door trick-or-treating. Between events at our church and my husband’s workplace, we end up with plenty of candy and most of the porch lights are off by the time we roll back into our neighborhood. Since those establishments only pass out individually-wrapped candy, I know the ingredients can be easily checked and cross-contamination is at a minimum. Stick with houses (or business establishments/organizations) you know and trust. What kid doesn’t like to take inventory of their stash as soon as they get home? This is not only fun, it’s also necessary for food allergies. My son sorts his candy into three stacks: candy he knows is safe, candy he knows is unsafe, and candy we need to check. If the ingredients are listed on the candy itself (and many are), it makes checking for allergens quick and simple. If they are not listed, a quick visit to the manufacturer’s web site will usually do the trick; most list ingredients of their candies there. SnackSafely.com provides a comprehensive list of peanut- and tree-nut free snacks (and many egg-free snacks). Click here for their special Halloween edition. After the sorting and checking is done, the swapping can begin. My son’s first option is his sister. Since most chocolate is off-limits for him (because most contain soy), this works out well for Sis. 🙂 She’s quick to swap him her Skittles and Smarties for his Reese’s and Butterfingers. If there are leftovers once bartering is done, he can then swap with me: I keep a supply of “safe” treats on hand that he can swap for his unsafe treats. I recently came across this idea of “buying” Halloween candy from your kids; I’m seriously thinking of using it this year! The Teal Pumpkin Project encourages families to offer alternative, non-food treats as an option for kids with allergies or other dietary needs. Their goal is to raise awareness of food allergies, but I think it’s also a great way to provide a little variety. Yes, Halloween becomes mostly about the candy, but it’s ultimately about the fun. So, thinking of treats beyond the sugary kind is fair game. If you’re worried about competing with those neighbors who offer full-size candy bars, check out this article with a great list of non-food treats that are sure to be a hit! When you live with food allergies (or have a child who does) any event, holiday, or celebration that includes food prepared by someone else brings with it a level of stress. The key to managing that stress is balance: be informed, be diligent, and be safe. Beyond that, relax and have fun. I want my son to be equipped with the information he needs to be safe. And then I want him to go out there and have some fun! Looking for more resources for a Safe (allergy-friendly) Halloween? It won’t be long before Holiday Parties are here. 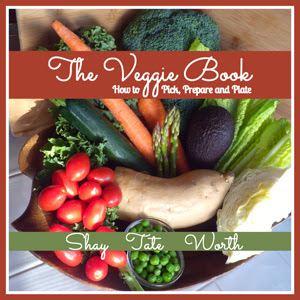 Find out how we navigate those with food allergies, too!